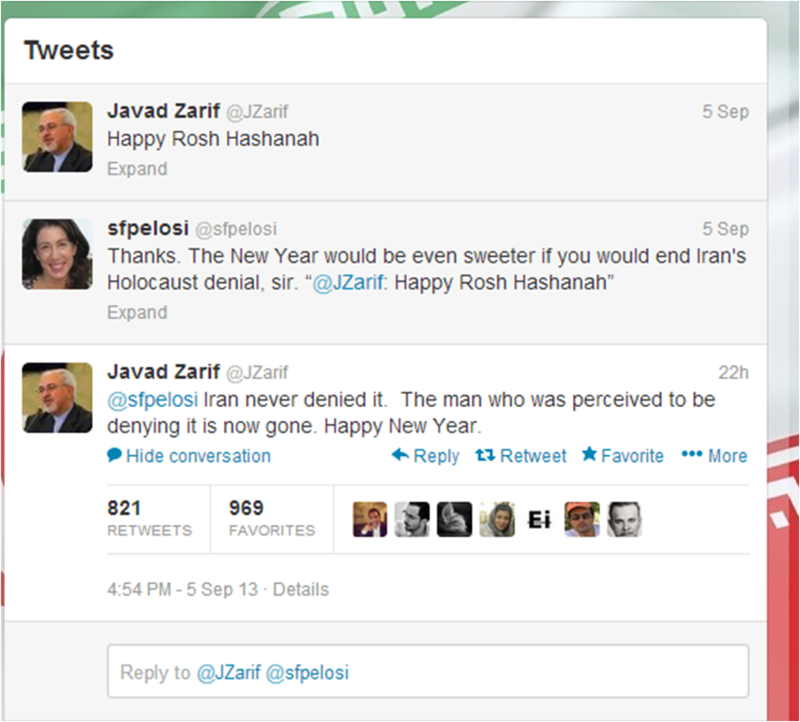 Foreign Minister of Iran, Mr. Javad Zarif tweeted a Jewish new year greeting to his followers. Activist Christine Pelosi (yeah, also the daughter of) tweeted back, thanking him but also pointing out the almost systematic holocaust denial by Iranian officials, namely former president Ahmadinejad. In an unprecedented move, Zarif, also a former ambassador to the UN and a Denver University graduate, replied what seems not only as words of criticism against the former president but also, a crack in the holocaust denial doctrine, fashioned to delegitimize Israel’s existence. There are roughly 25,000 Jews in Iran today, relics of a large Jewish community that dates back over 2,500 years. Today, there are about 100,000 Iranian Jews in Israel, 5,000 in Europe and about 20,000 in the USA. The former president is one of some who believe that the only justification for the State of Israel is the holocaust, therefore denying it ever happened would mean that Israel has no claim or right to exist as a sovereign state (that’s in a very tiny nutshell). 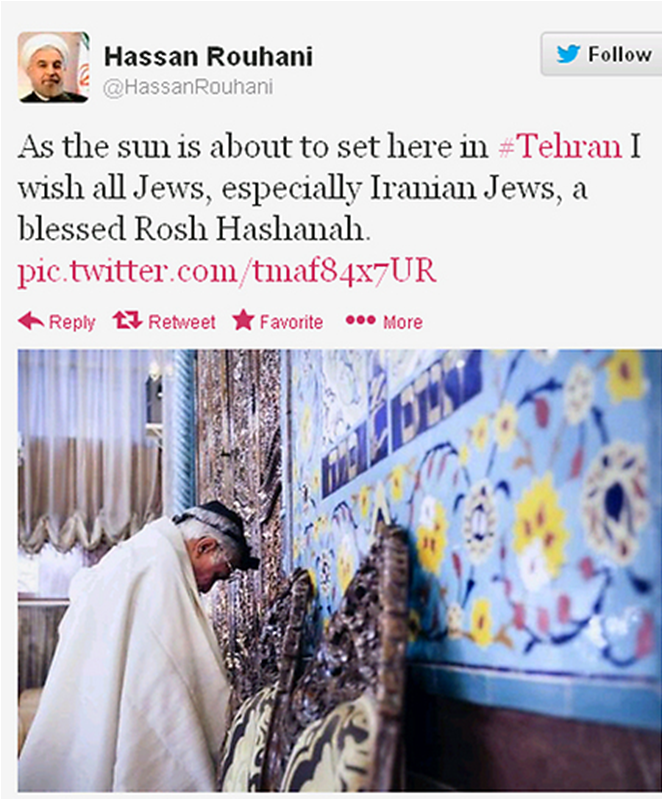 Also important to note is that Iranian President Hassan Rouhani also tweeted a New Year greeting that. This exchange of tweets gained Zrif over 2,000 new followers in just a few hours, and some media attention that expresses hope that this administration is proving to be more moderate as it promised. Interestingly enough, President Hassan Rouhani had also tweeted a similar greeting, however this was quickly followed up by his media adviser who claimed the president does not even have an account. Social engagement Vs. familiar methods of denial may be indicative of will Vs. confidence the new administration has or lacks, as it takes the reigns over a country with a glorious past, a depressing present and an unknown future. Is this twitter conversation a green light for Iranian civilians to speak their minds or is twitter the next online platform to be blocked in Iran by the Revolutionary Guards’ cyber team?